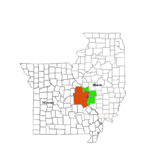 Old Jamestown is a census-designated place (CDP) in St. Louis County, Missouri, United States. The population was 19,184 at the 2010 census. Old Jamestown is north of the city of St. Louis and borders the Missouri River. Old Jamestown is located at 38°50′46″N 90°16′55″W﻿ / ﻿38.84611°N 90.28194°W﻿ / 38.84611; -90.28194. According to the United States Census Bureau, the CDP has a total area of 14.9 square miles (38.7 km2), of which 0.008 square miles (0.02 km2), or 0.06%, is water. The community is located mostly to the north and west of U.S. Route 67 in northern St. Louis County. West Alton is to the north, across the Missouri River. Florissant is to the southwest, and Black Jack and Spanish Lake are to the south. The CDP is located 17 miles (27 km) north of downtown St. Louis. ^ a b "Geographic Identifiers: 2010 Demographic Profile Data (G001): Old Jamestown CDP, Missouri". U.S. Census Bureau, American Factfinder. Retrieved January 23, 2013.